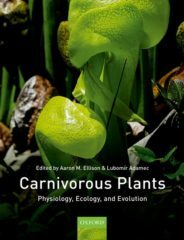 In the popular imagination, carnivorous plants are staples of horror films, high-school theater productions, and science-fiction stories. Many a child has pleaded with her parents to buy yet another Venus’ fly-trap to replace the one she has just killed by over-stuffing it with raw hamburger rather than the plant’s natural diet of flies, ants, and other small insects. 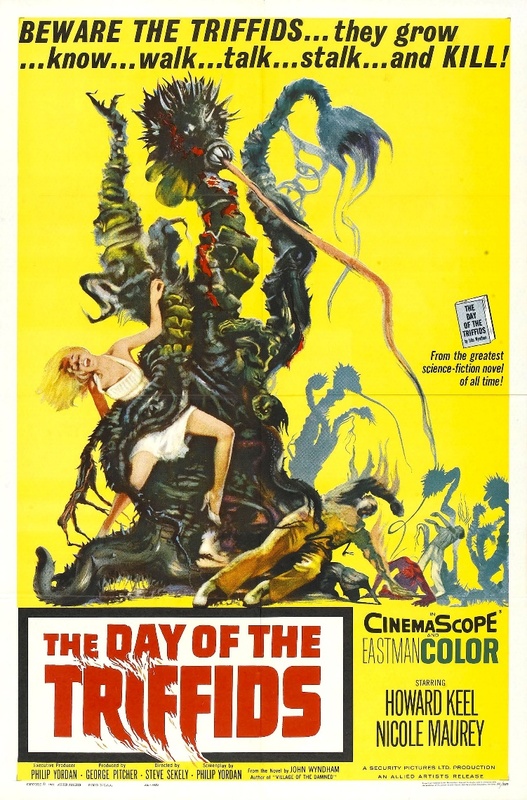 Poster for the 1962 film, The Day of the Triffids by Joseph Smith. Public domain via Wikimedia Commons. Botanists likewise have been fascinated by these evolutionary oddities that have seemingly turned the natural order of things on its head. Rather than being eaten by herbivores, these plants have evolved a bewildering away of adaptations to attract, capture, kill, and digest animal prey—usually insects—and then to use the digested and absorbed nutrients to enhance the plant’s growth and development. These adaptions—which so fascinated Charles Darwin that he wrote an entire book on what he referred to as ‘the most wonderful plants in the world’—include the sundew’s moveable tentacles coated with sticky glues to ensnare passing insects; the slippery, waxy coatings of the inside of pitcher plants’ pitchers that prevent prey from escaping their watery grave; the fluid-filled leaves of the Venus’ fly-trap that change their shape when an insect touches them, buckling closed in less than a tenth of a second; and many, many more. These adaptations also are inspiring biotechnologists to create biomimetic devices that are finding a variety of uses in our daily lives and novel drugs to treat a broad spectrum of diseases. In recent years, researchers have looked to the myriad ways that carnivorous plants trap and digest insects to develop biomimetic materials with a surprisingly diverse range of uses. For example, one of the primary attractors of prey to pitcher plants is the fleshy, often brightly-colored ‘peristome’ (literally ‘around the mouth’) that surrounds the gaping mouth of the plant. When the peristome is dry, insects can walk about it with abandon. But when it gets wet, from rain, fog, dew, or secretions of nectar by the plant itself, it becomes super-slippery and insects ‘aquaplane’ off of it and fall into the pitcher. Not only has the peristome led to the development of a range of natural, non-stick surfaces called ‘slippery liquid-infused porous surfaces’ (SLIPS)—think Teflon without the PFOAs—but because water flows in only one direction along the peristome, it also is leading to the development of controllable microfluidic devices, including drug-delivery systems, self-lubricating machines, and new types of agricultural drip-irrigation systems. 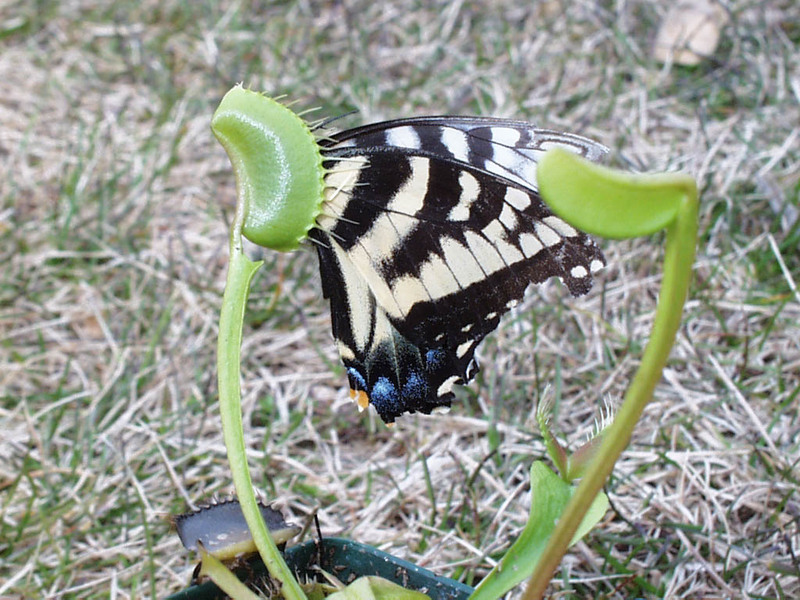 The ‘snap-buckling’ Venus’ fly-trap provides similar inspiration. Although scientists have been studying the fly-trap for more than a hundred years, it is only in the last decade that a detailed understanding of its inner workings. Briefly, when the trap is open, the leaf is curved outward, bent and stretched in two directions across the leaf. But when an insect touches the trigger hairs at the base of the trap—not just once, but at least twice, to avoid false alarms—the stretched leaf relaxes, causing the leaf to quickly buckle and snap shut. A Venus’ fly-trap (Dionaea muscipula) occasionally captures prey much larger than the plant can swallow. Photograph by the author. Snap-buckling is a low-energy way to change the shape of a variety of structures. For example, microscopic lenses can be fabricated that use snap-buckling to shift between convex and concave states. Because convex and concave lenses have different focal points, users of these micro-lenses could quickly re-tune micro-optical devices on the fly (so to speak). At a much larger scale, snap-buckling has been suggested as a way to design and develop complex shades for the outer, free-form façades of modern buildings. 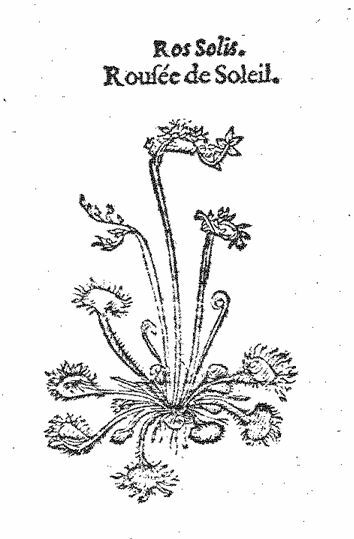 First illustration of a carnivorous plant, the sundew Drosera rotundifolia (from Dodoens 1554). Public domain via Project Gutenberg. 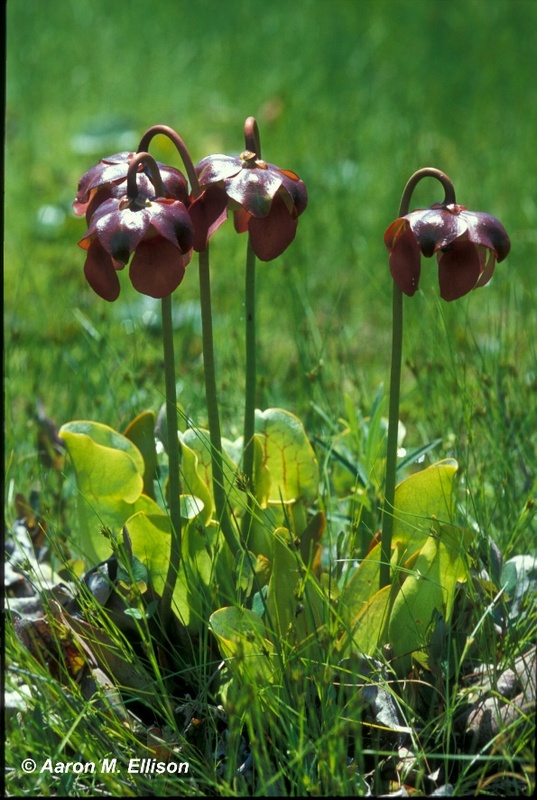 Native peoples and early colonists of North America alike were familiar with the curative properties of the American pitcher plants (Sarracenia species). For example, the Cree First Nation of Eeyou Istchee in Northern Quebec use a decoction of the leaf of the northern pitcher plant (S. purpurea) to treat Type-2 diabetes. In 1849, the South Carolina botanist, physician, and secessionist Francies Peyre Porcher made a detailed study of the uses of roots of the yellow pitcher plant (S. flava) to treat gastric upset, including indigestion, nausea, headache. And most Sarracenia species synthesize coniine, which may both attract insects and stun them once they are captured by the plant. Although coniine is perhaps better known as the poison that most likely was used to kill Socrates, it also is being studied as a next-generation, non-addictive pain reliever. The northern pitcher plant (Sarracenia purpurea). Photograph by the author. As carnivorous plants have moved from the fanciful, across the scientists’ workbenches, and into everyday utility, it is imperative that we conserve them in the wild and take care of their natural habitats. Poachers regularly deplete or extirpate natural populations, and carnivorous plant enthusiasts often plant them in sites where they would not otherwise occur (and yes, like John Wyndham’s triffids, real carnivorous plants can become noxious weeds with knock-on effects on native fauna, including our native bumble bees). 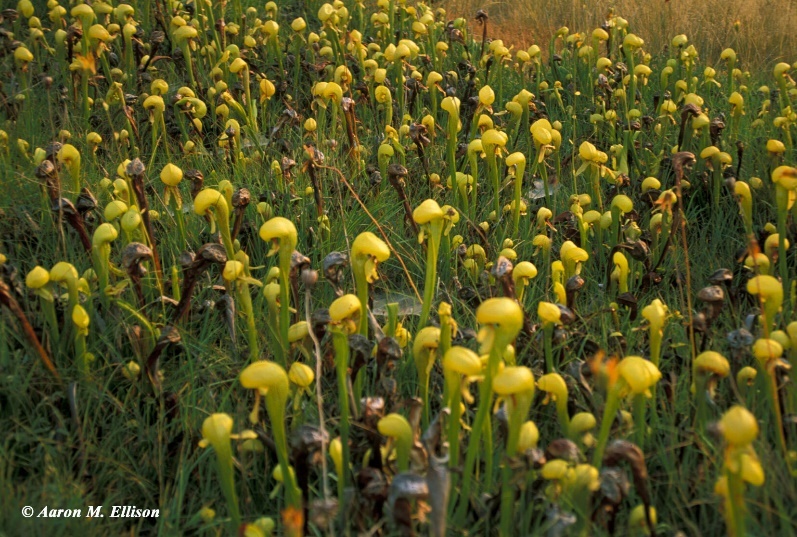 A field of carnivorous Cobra Lilies (Darlingtonia californica) in southern Oregon, USA. Photograph by the author. So, while you’re enjoying carnivorous plants in books, the stage, and the big screen, or learning to cultivate them on your windowsill, remember that nature not only has value to us, but also simply has value. Featured image: “Carnivorous Plant Nature Macro 217187” by PublicDomainPictures. CCO Creative Commons via Pixabay. Aaron Ellison is the Senior Research Fellow in Ecology in Harvard’s Department of Organismic and Evolutionary Biology and Senior Ecologist at the Harvard Forest, and a semi-professional photographer and writer. He studies the disintegration and reassembly of ecosystems following natural and anthropogenic disturbances; thinks about the relationship between the Dao and the intermediate disturbance hypothesis; reflects on the critical and reactionary stance of Ecology relative to Modernism, blogs as The Unbalanced Ecologist, and tweets as @AMaxEll17. He is the author of A Primer of Ecological Statistics (2012), A Field Guide to the Ants of New England (2012), Stepping in the Same River Twice: Replication in Biological Research (2017), Vanishing Point (2017), and Carnivorous Plants: Physiology, Ecology, and Evolution (2017).